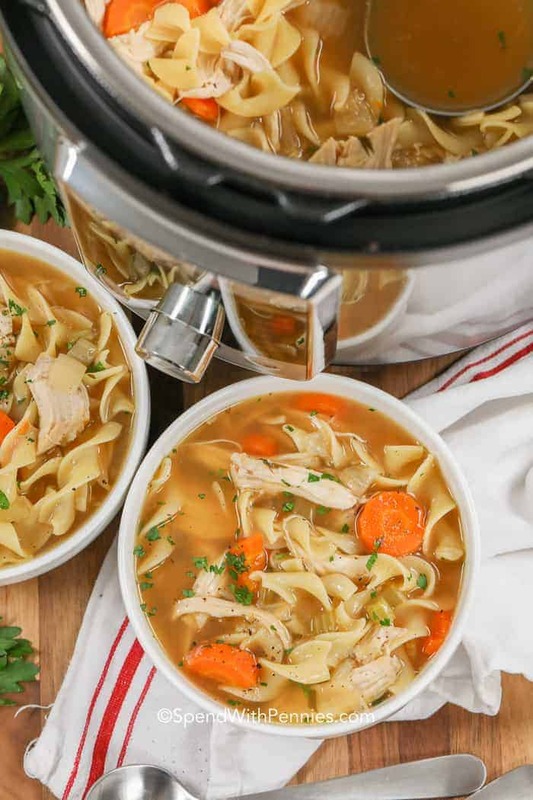 This Instant Pot Chicken Noodle Soup recipe is easy comfort food all year long. 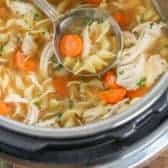 While I love to serve a simply perfect Crock Pot Chicken Noodle Soup, I love being able to create a homemade chicken soup in the pressure cooker in minutes. 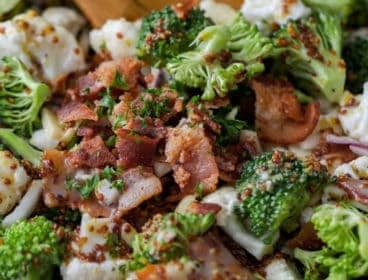 Using the Instant Pot provides the extra convenience of being able to cook everything in one pot for a quick weeknight meal. There’s nothing more nourishing or comforting than chicken noodle soup, especially during the chilly winter months! It’s like a hug in a bowl, loaded with tender chicken, veggies and noodles. 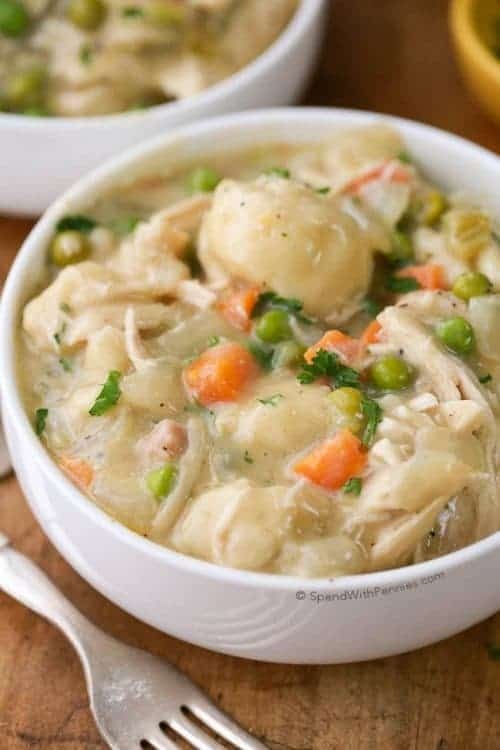 Remember your mother’s yummy chicken soup, slow simmered for hours on the stove or a slow cooker? 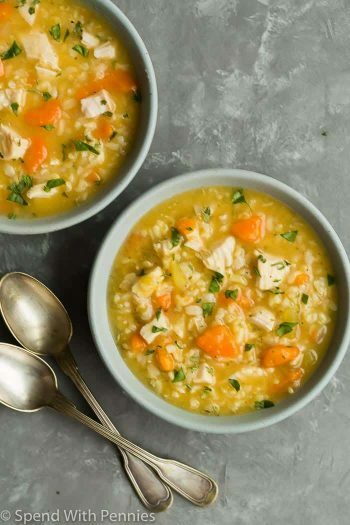 This Instant Pot chicken soup recipe is just as delicious but much quicker. 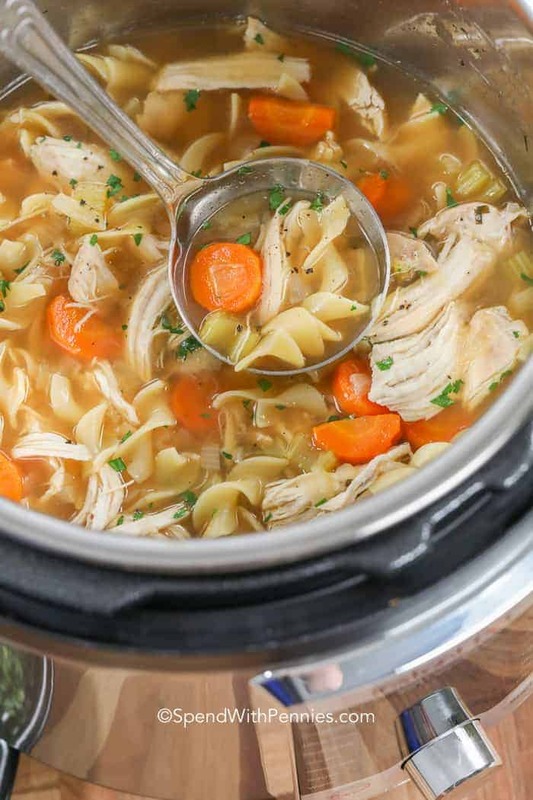 This recipe lets you take ingredients from refrigerator (or freezer) to steaming hot bowls of savory Instant Pot Chicken Noodle soup in no time at all. Saute an onion in the Instant Pot. Add all remaining ingredients (except noodles) to the pressure cooker and set to high pressure 10 minutes. Once cooked, remove the chicken and shred. 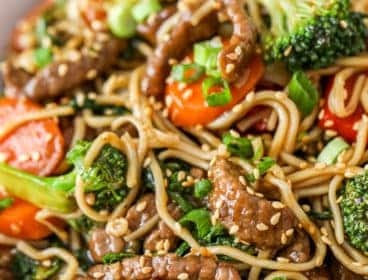 Set Instant Pot to sauté add the noodles to boil until tender. 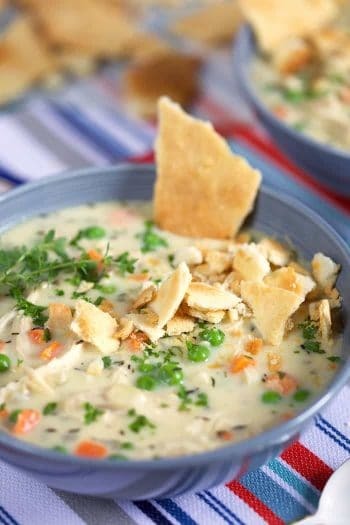 Instant Pot Chicken Noodle Soup recipes come in different variations, including chicken wild rice soup or chicken tortilla soup. Many of these recipes call for using the whole chicken, skin bones and all. 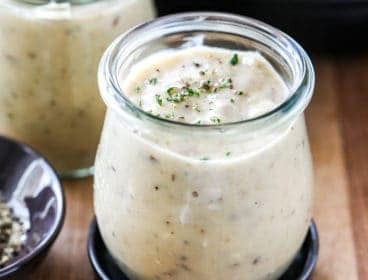 I wanted to give you something super quick and easy, perfectly fuss free for a weeknight and that’s how we came up with this chicken soup, Instant Pot style. Can You Cook Pasta in the Instant Pot? Absolutely, I frequently cook Instant Pot Mac and Cheese, it’s easy and wonderful. In the mac and cheese recipe, the pasta is cooked in the Instant Pot under pressure. In this recipe, the Instant Pot cooks the chicken and veggies under pressure however it is used to “boil” the pasta using the saute setting at the end. 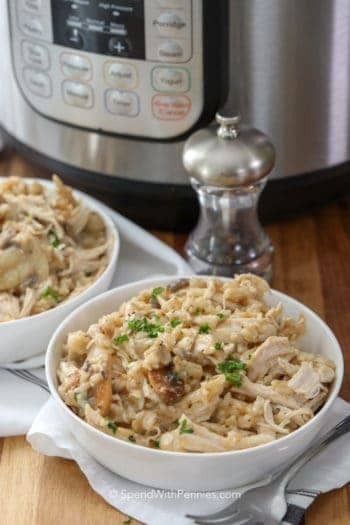 While the noodles could be cooked under pressure in this recipe, the chicken and noodles need different cook times and the Instant Pot takes a lot of time to come up to pressure. 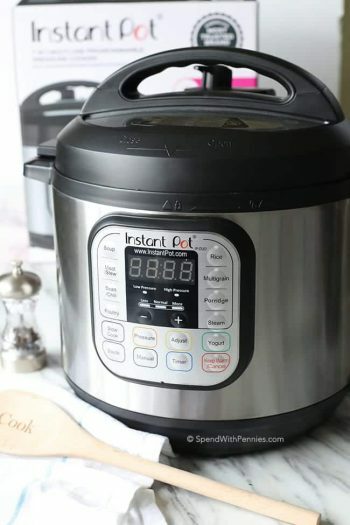 If you are new to Instant Pot cooking, then you’ll need to know about the two methods to release pressure. The first is natural release meaning the pressure will naturally release over time and there is no need to touch the venting knob. This method allows for continued cooking and also takes more time. 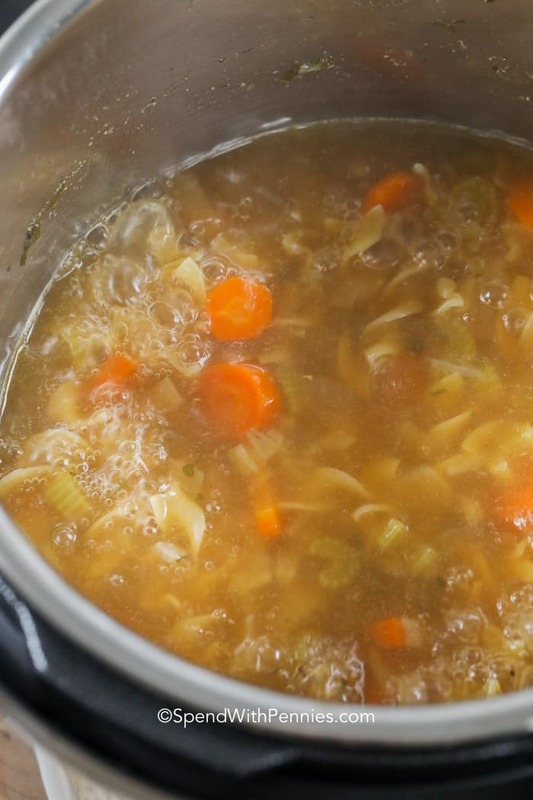 For the very best instant pot chicken noodle soup, use quick release. 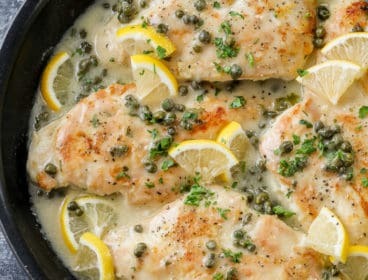 It’s perfect to get dinner on the table in a hurry. 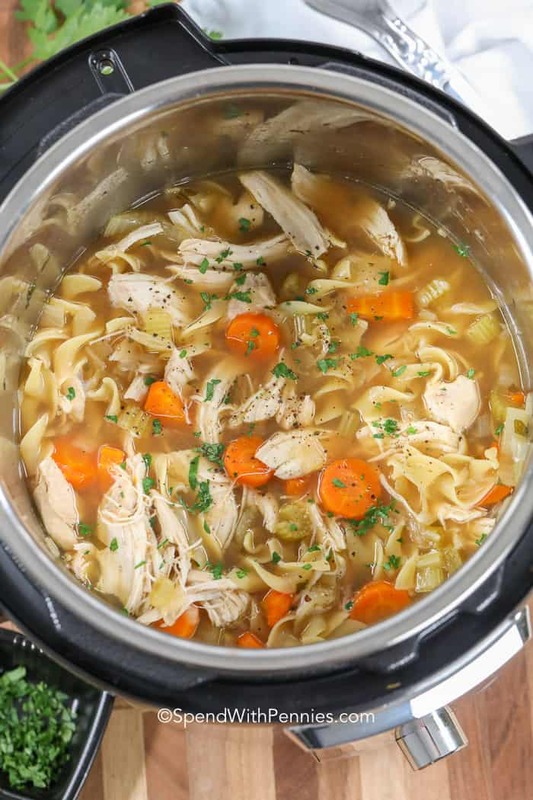 When making this Instant Pot Chicken noodle soup, you’ll use a quick release to stop the cooking so the chicken doesn’t overcook. When the cycle ends, just turn the venting knob to “vent” to release the steam. Always protect your hand with an oven mitt or kitchen towel to prevent burns as the steam is very hot. Quick release will make the pressure drop in seconds instead of minutes. Once released, the lid will easily open. Never force the lid off your Instant Pot if it doesn’t open easily, it is still under pressure and should not be opened! 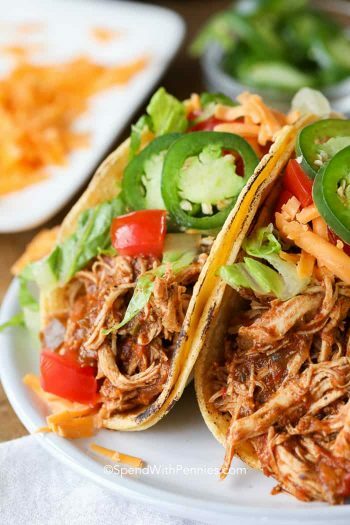 Instant Pot Chicken Tacos (Pressure Cooker) – my daughters favorite! 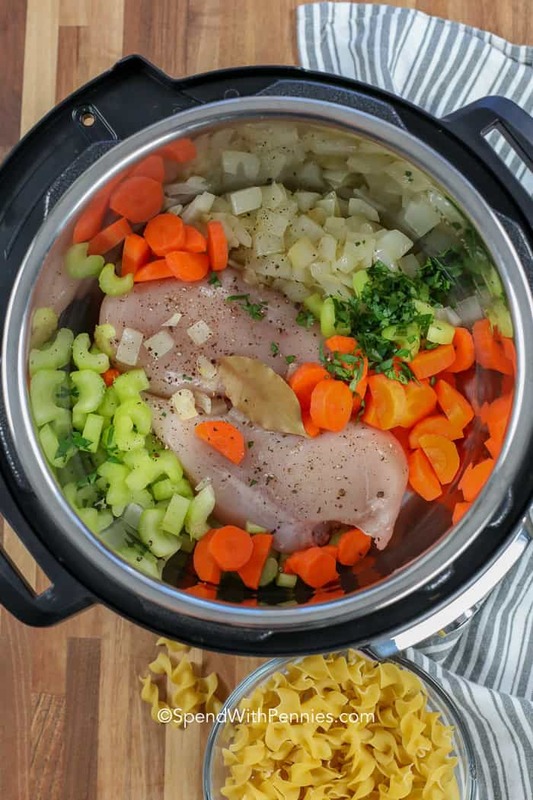 You’re going to love this Instant Pot chicken soup recipe, especially if you’ve ever made chicken noodle soup the old fashioned way. Turn the instant pot on to SAUTE. 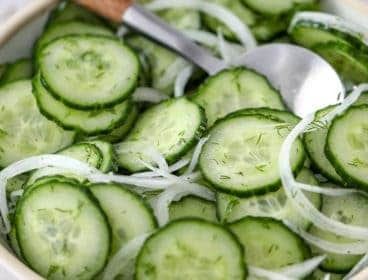 Cook onion in olive oil until softened. Add remaining ingredients except noodles. Select SOUP (or MANUAL), HIGH PRESSURE and change the time to 10 minutes. The instant pot will take about 10 minutes to build pressure. Quick release pressure. Once cooked, remove and discard bay leaf. Remove chicken breasts and shred with a fork. 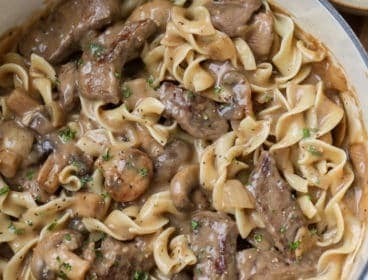 Turn Instant Pot onto SAUTE. Once broth begins to boil, add egg noodles and allow to simmer 6-8 minutes or until tender. Stir in chicken and season with salt and pepper to taste.